Investors absolutely love the video game business. Last week Katusa Research put out a series of research essays on the video game sector. In case you missed last week’s research, we’ll get you up to speed quick. On Day 1, you learned about a sector that will knock “old sports” off its pedestal. And how some of the biggest athletes in the world are getting involved in video games – in a big way. On Day 2, we revealed how a single video game called Fortnite made $1 billion in just the first five months of the year. On Day 3, we introduced you to the video game and publishing giant, Tencent. It owns the world’s largest gaming and social media companies. And it’s one company that can make or break a video game. The key takeaway from all our research is this: Video games are a massive industry that you need to pay attention to. It’s where Bitcoin was in 2016. Where cannabis stocks were in 2015. The video game industry has the potential to be a massive bull market. Developers are in high demand. And so is investor appetitive in games that can make an impact. The good news is that a game doesn’t even have to be a hit to make money. Games that aren’t even discussed in North America are making hundreds of millions of dollars of revenue per year for the companies that own them. One of the best grossing PC games of all time—another free-to-play shooter—is a game you’ve probably never heard of before. In fact, if you asked your kids, chances are pretty good that they’ve never heard of it before either. CrossFire, developed by a South Korean company and first released in China in 2007 by Tencent, is a game that never really took off outside of Asia. In 2014, CrossFire had the highest revenue of any video game in the world. By 2016, it had raked in a total of $6.8 billion. Even more important, the cash flow has been consistent since 2013. Another benefit for the developers of video games is that the cost to produce the game is recovered very quickly. 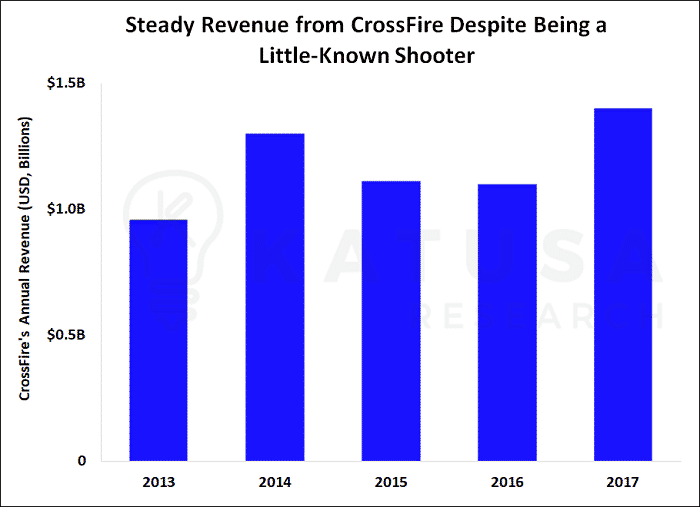 The launch of CrossFire, a game that is virtually unknown outside of China, recovered its full capital cost to build the game in the first four months after release. Other than minor costs to maintain the game with new options, the full revenue is essentially converted into earnings for the owner of the game. The major success of CrossFire proves that a game does not need to be on the tip of every kid’s tongue to make an absolute fortune. You still don’t really hear anyone talking about video games. News stations might talk about the latest hot game or app release. And business shows might discuss earnings at big video game companies such as Electronic Arts or Nintendo. For the most part, though, video games seem to get glossed over by the media, as if they are irrelevant. The industry is dominated by established developers like Take-Two Interactive Software Inc. and Electronic Arts Inc., which crank out predictable updates to franchises like Grand Theft Auto and Madden (now in its 29th version). There are a few massive investment opportunities sleeping just beneath the surface of the water here—unseen by most. A few small companies have moonshot potential. And thus there is an opportunity to make a once-in-a-generation asymmetric bet. The Special Situations team at Katusa Research is looking deep into several opportunities right now. The retention rate refers to the percent of people who are still playing the game after a certain period of time (in essence, how “sticky” the game is). When you open up your phone and look at your apps, you probably see some that you haven’t used in months. Others you probably haven’t even touched since installing. It’s the same for video games. With fast internet, it’s very easy for people to download a new game, try it out once and never play it again. So it’s important to see how many new players are still playing the game days or weeks down the road. Retention rates fall most sharply between the first day a user downloads a game and seven days after. After that, it typically only falls by a couple of percentage points each day until the 30-day mark. After a month, retention rates stabilize. That’s why 7-day and 30-day retention rates are the most often used benchmarks when analyzing a game’s staying power.